This it the Prius set up with a TEST pull – a temporary hitch. It will be level when the car and our trailer are outfitted with the custom set up through CanAm RV in November. So many questions. So many “what ifs!” We ordered our Alto trailer last January, and have since been bouncing around the questions and the what ifs. Most of these revolve around logistics of getting, pulling and storing the trailer. The biggest unknown was how and if we would be able to pull the trailer with our Prius. Bob has a 2011 Prius, which we intend to be the tow vehicle, and Mimi has a 2007 Prius. The back up plan if the Prius didn’t work out would be to sell the 2007 and buy another vehicle to tow with. This unknown had us looking at cars and small SUVs. But…..we are totally spoiled. Know what kind of gas mileage the Prius gets? The trade-off is obvious with any other car. The most serious contender was probably a Volkswagen Jetta diesel. But. But. But. As we pulled in to town, we saw the dealership right off the freeway. We hopped in to ask directions to the Dalewood Conservation area campground, which is located only about 10 minutes from Can Am. The nice receptionist, Wendy, said we could camp in their parking lot, but we decided to move on as it was HOT and still fairly early in the evening. The next day, we headed back to Can Am for our chance to see both models in person and even to tow them both, if we wanted. Evan greeted us at the dealership and gave us a tour of the Alto 1723 and the Alto 1743. (Our sales woman and regular phone contact, Ana, was on vacation.) He told us that both trailers tow nearly the same, with the 1743 having a slight advantage. (The explanation here has to do with the contours of the 1723 and a comparison to the aerodynamics of an airplane wing.) We liked the 1743, even more upon seeing it, and were happy to get this news about the towing. So the fantastic people* at Can Am used a temporary hitch to ready the Prius to tow the Alto. Andy showed up, and Bob and Andy took her out for a ride. And it all worked out grand! Andy was impressed at the ample power the Prius showed, even from a stop on a steep hill. Bob thought the trailer felt like it wasn’t even there (don’t forget about it!) And here is where I was disappointed that my battery had gone dead on my phone camera. Before we left, Kate, the very personable bookkeeper extraordinaire, organized all of our paperwork, and we left satisfied that we understand our total cost and the logistics of picking up our camper in November. * This is a good place to say how wonderful our experience was visiting Can Am RV. Everyone we have spoken with or met with has been genuinely caring, honest and very knowledgable. This is a great company and we recommend them to anyone looking for a trailer (not just and Alto)! 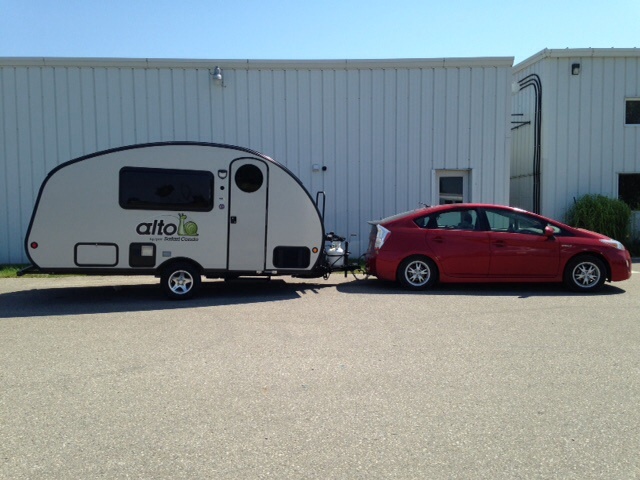 This entry was posted in Alto, camping, eco travel, Prius, trailer and tagged alto, camping, Can Am RV, light trailer, Ontario, safari alto, trailer. Bookmark the permalink. 2 Responses to test drive! Thank you very much for the write up of your experience with the Alto and Can-Am. I myself had just put in a deposit through Can-Am as well (delivery date estimate August/September 2016) so it was a relief to hear of the excellent customer experience you’ve had. I had been wavering between the R-1723 and F-1743 models. I was certain I wanted the retractable roof version (R-1723) until I read several blog posts, yours included. I’ll be on a contracting job that will be taking me around the US so I will essentially be living in it. I loved your points regarding windows and space. I’m flying in to the US/Canada to visit Can-Am next month to view them, but had already tentatively changed my order to an F-1743 based on the strength of recommendations (yours included). One item that seriously concerned me was towing vehicle. I’ll have a Jeep Wrangler Sport that lists a 2,000lb max tow weight (with the OEM tow kit). I was pretty concerned about towing the heavier R-1723, so it was another relief to know the F-1743 may be better for my purposes! The fact that you plan to tow your Alto with a Prius has removed an incredible weight of worry from my shoulders. Not to mention that’s downright amazing! Please continue to write about your journey, it has actually made a world of difference to me (I’m in Ireland so I won’t really have the luxury of getting back to the US more than once to view and settle on my Alto options before taking delivery next year). It’s also nice to hear you’ve had a great experience with Can-Am. I’m working with Kirk (Andy’s brother I think) and he’s been a wealth of knowledge, too, and fantastic about taking my calls and following up via email. Thank you for your comment. It’s great that you are able to make the trip to see the Alto in person. You will know for sure which one is for you once you see them. Thanks you, too, for your supportive view on our decision to pull with our Prius. We feel it is important to try it out (responsibly of course!) and will continue to write about our experiences. Good luck with your trip to Can Am!